This book is really special to me, not only because it’s a really really good book, (which it is) but because I got to see the author talk about this book and other cool things and I really felt for the first time since Harry Potter that anticipation and excitement that comes with having a brand new book in your hand. Also I have a signed copy which is really awesome and I fangirled pretty hard over that. So this book is extra special to me, and I will treasure my copy endlessly. On to the actual book. 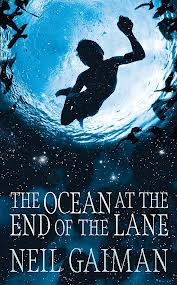 The Ocean at the End of the Lane is a adult book, narrated by a seven year old boy about the mysterious and maybe magical events that happened at the end of his lane. Although our protagonist is very young, this is not a children’s book in that same way that The Book of Lost Things isn’t a children’s book. The seven year old boy and his family are nameless, and I think this adds more to the charm of the book and allows the reader to almost become that little boy, helpless and powerless to the whims of the adults around him. I LOVED this little boy. I wanted so badly to help him and rescue him and at the same time I felt that horrid pain that you have when you are young and adults are there to boss you around and nobody takes you seriously. I liked that he wasn’t a hero, he was just an ordinary little boy. In true Gaiman style, the ‘monster’ in this book was terrifying, and I absolutely LOVE the mythology that he created in this book. I thought it was wonderful, imaginative and absolutely bonkers. It was also written exceedingly well. The prose was absolutely beautiful, and very quotable. This book is tinged with nostalgia for a landscape, but unlike many other books not for a childhood. I think this sums up the book perfectly. Please go and read it. The Graveyard Book is my favourite! Thank you! I need to read this! I need to read more of his stuff, I’ve only read Good Omens and Stardust! Your review makes me look forward to meeting the little boy and the monster! Its SO good! I also really recommend The Graveyard Book – it’s my favourite of his!